I wanted an easy project, with an easy-to-memorize pattern, that I could pick up and set down without fear of losing my place, and which would be transportable. While I didn’t find quite what I was looking for in my usual places (my digital library, Ravelry, Pinterest), I did find some things that seemed close. Meanwhile, I had time for a visit to my favorite LYS, River Knits, where I enjoy spending time between meetings when I am in downtown Lafayette (Indiana). I picked up two balls of Berroco Millefiori, in color 7891 “Terra.” This is a nice variegated yarn in a bulky (#4) size. The color patterns looked nice, but would not show up well in a fussy pattern (lacy or otherwise). I found a herringbone stitch that I liked, but thought that it would look too plain for the nice yarn. I decided to make it a diagonal herringbone, and it turned out just like I wanted. Pattern is easy: Cast on 35 stitches (or any odd number). Row 1 – Knit through front and back of first two stitches (increase 2), *Slip 1, Knit 1, pass slipped stitch over knitted stitch and knit slipped stitch. Repeat from * to last 4 stitches, knit 2 together, knit 2 together (decrease 2). Row 2 – Purl 2, Knit 1, *Purl 2 together, then purl through 2nd stitch before dropping off needle. Repeat from * to end. Repeat Rows 1 & 2 until you have just enough yarn left to bind off. I used two skeins of the Millefiori, which was perfect for this project. I think the herringbone stitch and diagonal format worked well with this yarn, and I really enjoyed this project. The resulting fabric is soft but sturdy and will make a nice warm gift. Champagne Bubbles is another pattern from Nancy Marchant, this time published in Vogue Knitting, Holiday 2014 (available as a digital purchase). I’ve looked at brioche patterns by other designers, but Nancy Marchant’s pattern format is the easiest to read. I’ve noted in earlier posts that it seems to take me a while to get the hang of a particular brioche pattern – though it shouldn’t, since for every four knitted rows, there is only one “pattern” row – the rest all are knitted (or purled) in a standard manner. Other patterns I’ve read have detailed every row as a “row,” rather than 2-sets-of-2 or a set of 4, which (IMHO) makes them far more difficult to read. In the case of Nancy Marchant’s patterns (at least as far as I’ve knit them), once I get the hang of the major pattern, I can easily memorize the format and knit more quickly and confidently. That is, “once I get the hang of it.” As usual, it took me no fewer than 6 attempts to “get the hang” of this pattern. This is my first attempt (and a rare version of Nancy’s patterns) to incorporate lace. It took a while to be able to “read” the double-yarn-overs on the 2-of-4 row and knit (or purl, or slip) properly. Even though Nancy Marchant’s brioche patterns take time to read, understand, and properly execute, they make beautiful projects, and the unique light and fluffy fabric is wonderfully inviting to the touch. Yarn: I’m still enjoying my “Shawl in a Ball” binge, this time with color Peaceful Earth. 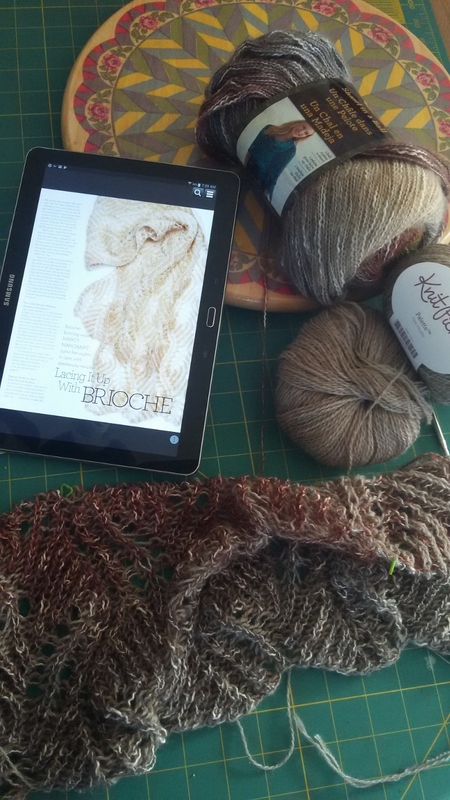 I’m augmenting the pattern with a second color from Knit Picks Palette in color Camel Heather. One twist: I purchased the downloaded pattern via the Vogue Knitting App, and haven’t been inclined to try to figure out how to print out the pattern onto paper, so I’m only using a digital version. Since the pattern (now that I’ve started over several times) is fairly easy, I’m OK with not having a paper pattern. Now, if I could just find time to do more than one round of four at a time! I’ve made Simple Skyp Socks (free Ravelry download) several times; it’s an easy pattern that is suitable for males, looks nice, and is adaptable to any foot size. The current project is for a special male in my life; I hope it warms his toes. Yarn is On Your Toes by Kertzer in color Camouflage. The yarn company seems to be out of business, and the yarn is only available through second-party sources (eBay and the like). Too bad – I like the wide color bands and the yarn is treated with Aloe Vera for additional softness and warmth. I purchased this skein a few years ago from my favorite LYS: River Knits. I only purchased one skein (400 yds), so I hope I have enough for a man’s sock. So, I’ve started a project using the Brioche stitch I’ve been practicing. The project is F729 Brioche Cable Cowl, by Vanessa Ewing. From my previous post, I wrote that I was going to use smaller needles because the swatch seemed too sloppy with the recommended needle size 8 (5mm). I switched to size 6 (4mm) for this project and started knitting. The yarn is Caron Simply Soft Shadows in Mardi Grey. I have two skeins leftover from a baby blanket from several years ago. It’s a nice variegated color yarn with a solid color base twist. Unfortunately, I don’t think the yarn is still being made. 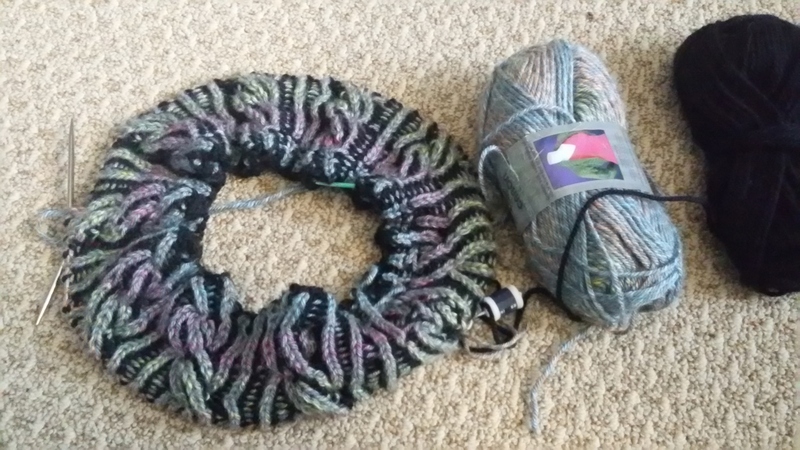 The contrast color is a black skein in my stash that I’ve used for trim in other projects. First, I have a suggestion to the designer – In the pattern text, she refers to the colors by their color name, rather than “MC” (main color) or “CC” (contrast color). I rarely actually used the yarn noted in a pattern, and even if I did, I wouldn’t think of it as “Galway” or “Gina” – I would think of the yarn as “black” and “colored” or “MC” and “CC.” It is very confusing to use the color names in a pattern! Second, I used the Stretchy Slipknot (link to video) cast on, instead of the Longtail Cast on, for two reasons – one, the Longtail Cast-on is a pain over a high stitch count and two, it’s not as stretchy as I think this project needs. Should have used the larger needle – it’s not too bad on the straight rows, but the cable row is too bunched up, and it was very tight to knit the cables. I made a big mistake early on – I’m not sure what I did, but it resulted in “floats” in one row, all along on one side. I thought that it would block out or obscure with use, but it’s still painfully obvious (to me, anyway). There are a lot of other mistakes – like a few cables that go the wrong way and look odd, and it looks like I missed the count transitioning from row to row, in a few spots, which looks messy, and I think I dropped a bunch of stitches, at one point (I have no idea how that happened – I picked them up when they were found, but I can tell where it happened). I am also fairly confident that I won’t have enough black yarn for the entire project, so I need to dive back into my stash for something else. So, I’m calling this a “swatch” and starting over – lessons learned. But, I think I’ll enjoy the project, and I’m looking forward to Round 2. Weird float mistake is on the other side -not visible in this photo. I promise, I only went into Hobby Lobby to get Thanksgiving paper goods for next week! I did not intend to buy yarn! You must believe me! Yet, three balls of this interesting yarn jumped into my cart, and I had to take them home. Introducing, “Shawl in a Ball,” by LionBrand. This is a two-ply, acrylic/cotton blend yarn. The yarn band says “medium weight,” the website says “worsted weight” and recommends size 8 needles, but I’m using size 5 needles, and I would class it as a light worsted weight. The band says 518 yards – hence the name, “Shawl in a Ball,” as 518 is enough to make a small shawl or wrap. LionBrand has a selection of terrific free patterns that go with this yarn. You can find it here: Lion Brand Shawl in a Ball Patterns. However, as I have perused knitting magazines (or Pinterest or Ravelry- and don’t we all do this? ), I have tagged a collection of patterns I would like to try, and I selected Lace Shawl, published by Interweave Knits. I think I obtained this pattern via one of Interweave Knits’ periodic free booklets. Though labeled as “Intermediate,” I would call it more “easy,” since the pattern is a 16-stitch, 8-row repeat, with 1-sided lace (purl on the wrong side). It’s great for quick knitting while binge-watching Arrow on Netflix (I’m two seasons behind). Like a lot of shawls, this seems to be knitting up small, but should block to size. I raced to complete the Cachoeira Socks because I was anxious to get started on a KNIT A LONG! I have never participated in a KAL, but had been intrigued by the notion. 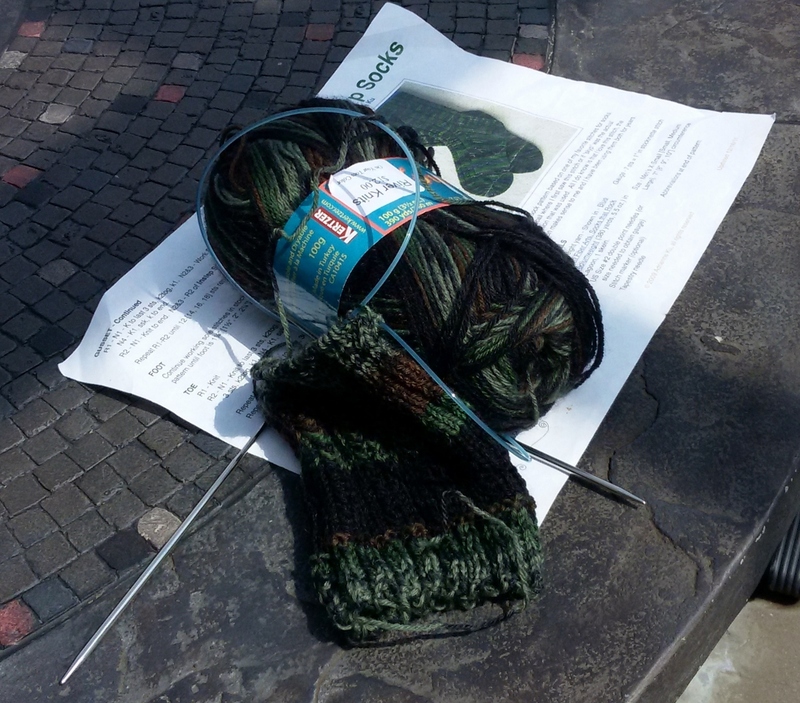 This time, the stars aligned with the “right yarn” (as recommended by the designer), the right needles (as soon as the Cachoeira Socks were complete, the circular needle I needed would be free… knit faster! ), and a pattern that seemed interesting. I’ve followed Knit Purl Hunter for a while and watched several of her instructional videos. Michelle Hunter is a teacher by trade and produces great videos as well as very clear written instructions. The project is Cableship Socks, and while I was a little late getting started (due to my need to finish another project) I quickly caught up. This is a quick and appealing project, and the yarn is terrific. Yarn is Zauberball, made by Schoppel Wolle. I had previously (and unrelated to this project) purchased two balls from my LYS, River Knits, and had been looking for an appropriate project. Unfortunately, I lost the yarn tag, so I don’t know the color. It does not seem to be one of the published colors. Because this is a fast project, I knit both part 1 and part 2 in a few days. Michelle Hunter recommends Judy’s Magic Cast On, and has a new video to demonstrate the technique. I have always found that technique to be awkward, and usually had to both reference a video and make multiple attempts every time I used it. I recently discovered the Turkish Cast On with one circular needle, which I find very comfortable and a lot easier. The Heel is crafted via the German Short Row technique, and Michelle Hunter has the best written instructions for this technique, as well as a very good video HERE. I’ve tried GSR in earlier socks, and while I like it, it’s always required a fair amount of attention to complete. Michelle Hunter makes it very easy to understand and apply to socks.